C.J's Puppy Primer Class will give you information on the basics for housetraining, chewing discrimination (helping your puppy choose his own things to chew on rather than your things), leash and collar acceptance, safe and effective ways to socialize your puppy, crate training, choosing toys that are safe for your puppy, and lots MORE!! The Puppy Primer Class is one session and the cost is $15. Puppies do not attend this class, just people. Registration forms and vaccination records are not required for this class. At the end of class you will have the opportunity to purchase items for your puppy if you so desire. If you decide to join Puppy Kindergarten at C.J.’s Dog Training, your Puppy Primer Class fee can be applied to the Registration fee. Give us a call and let us know you are coming. C. J. 's offers puppy kindergarten to help people understand and enjoy their puppies, and to give the puppies a great head start. Puppies can begin attending class after they receive their first vaccinations and should be under 18 weeks when they attend their first session. Young puppies are very impressionable. During the time between the 5th and 20th weeks your puppy will form his basic attitudes about life. During this critical stage of development we can help him choose good behaviors and use positive methods to teach him new things. This will enable your puppy to learn new things much quicker when he/she grows up and will make him/her a more well adjusted adult dog. 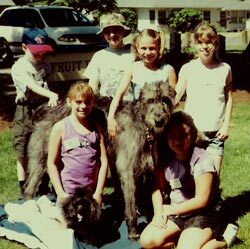 Puppy Kindergarten class provides a safe environment in which to socialize your puppy. The class includes: housetraining, chewing discrimination, bite inhibition, socialization, learning appropriate play skills with other dogs and with humans, exercises teaching trust and confidence and much more. Your puppy will start learning sit, down, manners on the leash, greeting people without jumping up, and will learn to come even when playing with other puppies. You will learn how to help your puppy choose the behaviors he will need to successfully live with humans. This class is designed to teach your dog good manners and self control around people and other dogs. They will learn to pay attention to you even in a distracting environment. Class curriculum includes loose leash walking, walking at your side, sit, down, come, greeting people appropriately, wait (at doors), go to your rug, and how to be quiet. You will also learn how your dog thinks and how to use his natural instincts to enhance the training process. 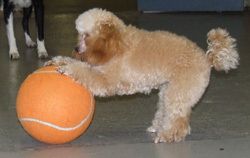 Dogs can begin class at 4 1/2 months of age and are never too old. This class builds on the foundation from Beginning Obedience class. The dogs learn increased self control with bigger distractions, increased distance and longer duration of exercises. The exercises required for a Canine Good Citizen Test are included in this class as well as long line work and teaching tricks. Intermediate class gives you the opportunity to continue to work with your dog in a structured environment so they will become even more reliable. Students will be given the opportunity to take the CGC Test after they complete the class. Your dog will also learn a trick at the end of each lesson. Beginning Obedience class at C.J.’s is a prerequisite. Rally is a fairly new dog sport created by Bud Kramer, who established dog agility in this country. Many people want to do more with their dogs after they learn basic obedience and are interested in doing Agility or Competition Obedience. Both, however, require good off leash control even in a very distracting environment. Rally is a great next step whether you're interested in competition or not. 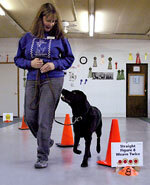 Rally class will improve your dog's obedience skills and build a stronger bond between you and your dog. A course will be set up with numbered signs. Each sign will give you an instruction. You will proceed through the course and perform the exercise described on each sign. In Beginning Rally there are 42 different signs. Your dog will learn to focus on you as you work together on each new exercise. 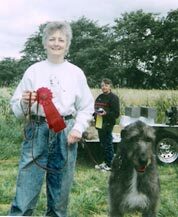 The emphasis is on fun and team building for both the handler and dog. Beginning Obedience class at C.J.’s, or approval from the instructor, is a prerequisite. C.J. offers private lessons for students whose schedule does not accommodate our classes, for dogs who are not appropriate for classes, or for students who need help with specific problems or problem solving. These lessons are offered in the privacy of your own home or one on one at the training facility. The Canine Good Citizen Test is offered at C.J.'s. Dogs that pass all 10 items on the test can receive a CGC certificate from AKC (American Kennel Club). See AKC's website at http://www.akc.org/ for information about the test. This test is open to all dogs, both purebred and mixed breed. The test can help you decide if your dog would benefit from more training. If you are interested in taking the test, call us for more information.